National Leader of the All Progressives Congress (APC), Asiwaju Bola Tinubu, yesterday, urged non-indigenes in Lagos State, especially the Igbo, to ignore the Oba of Lagos, HRM Rilwan Akiolu’s threat that they would die within seven days if they did not vote for the APC governorship candidate, Akinwumi Ambode. 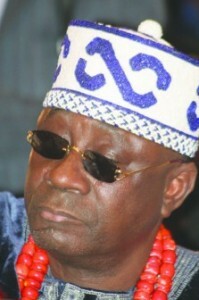 He said those who visited the Oba should have come to the political leaders of the state and not the monarch. Speaking at APC governorship campaign rally at Coker, Orile-Iganmu, Tinubu said: “PDP is full of liars. Their leader in Lagos, Bode George is a liar, the other person, an Igbo man, Ifeanyi Ubah, is also a liar. Ubah knows that we are the political leaders but the Obas are not, ignore whatever they say on politics. Tinubu said Lagos State government had never discriminated against anyone and will never do so. “We have never discriminated against anyone in Lagos. We pay WAEC fees of students in the public schools irrespective of the state they come from. Every year, we organize Spelling Bee competitions and it has been won most times by children of the Igbo in this state. One of them is Ebuka, an indigene of Anambra State. He won the spelling bee competition. We didn’t say because he is Igbo, we should turn him down. We did not discriminate against him, he acted as one-day governor. “So Igbo cannot say they have not governed Lagos because Ebuka acted as one day governor here. We sent Ebuka to Switzerland for training, we also sent him to a computer school. He went to Obafemi Awolowo University (OAU) and got his degree before going back for his masters on our scholarship. He now works for Oando as executive and he is in Canada as we speak,” the former governor said. Can Juventus Win The UEFA Champions League?